Two summers ago, during a Fourth of July celebration, I discovered four baby blackbirds in a nest. The nest had been driven on a flatbed trailer some 150 miles, and it was only after the planting of the tree, a densely branched fir that a friend ordered from a tree farm, that anyone realized a family had been uprooted as well. This occurred in the Madison Valley that is the setting for the “Gray Ghost Murders,” which will be published this February, and I was well into the writing of it when I first heard the nestlings squawk. So began the most demanding artistic endeavor of my career, for nestlings must be fed every fifteen minutes and heretofore I had aligned myself with that school of writing championed by Oscar Wilde, whose idea of a morning’s work was to insert a coma, and in the afternoon to take it out. With the birds summoning my attention — and the squawking of a Brewer’s blackbird is not to be ignored — I found that in order to avoid feeling a total failure I had to insert more than punctuation during the intervals of silence. And so, sitting under a sun umbrella near the chicken wire enclosure I had built to house the little darlings, the “Gray Ghost Murders” was coaxed to life, and, in the process, I discovered that if you actually put words down as they came into your head, so that you might weigh and weed them later, rather than endlessly editing in your mind before committing so much as a period to the screen, then writing need not be a tortured blood letting of a drop at a time, but could move and sing through your veins, or at least emerge onto the page in complete sentences. In three weeks the birds had feathered over to become the terror of the neighborhood, soaring to parts unknown every evening, but usually perched on the top branch of a giant spruce in the morning, four little sentinels sitting side by side. For another month they continued to need supplemental feeding and I would have to place a hand over my head to avoid being mobbed the moment I walked out the door. But what started as an act of mercy became a privilege as the summer grew short, for not only had these birds taught me a lesson about my craft, but they gave me a gift rarely awarded humans beings, a personal glimpse of the indomitable wildness of spirit that is heard not only in the voices of wolves and elk from the mountain folds, but in the songs of our backyards. 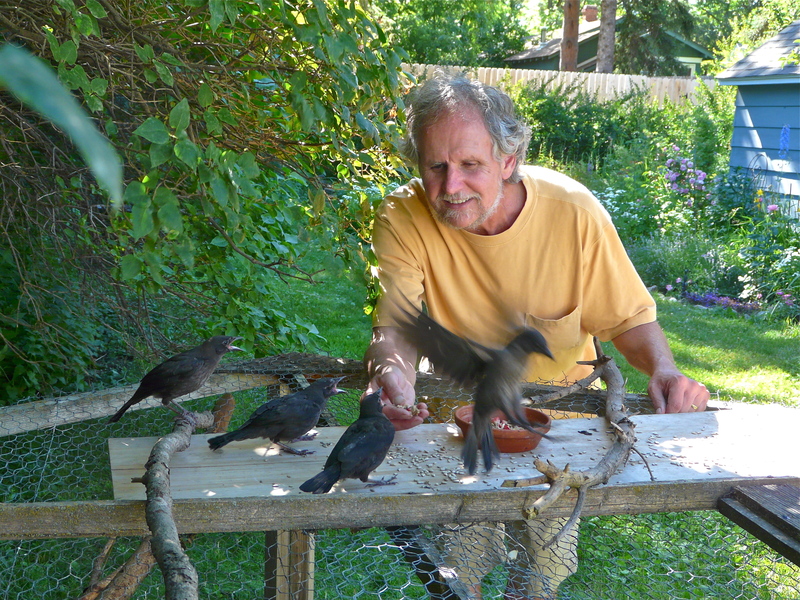 By fall the siblings had become part of a larger flock wheeling in the sky, peeling off to visit me once or twice a day, the runt I called Blackie still hopping onto my laptop to take mealworms from my fingers. On October 12th, I saw them together for the last time and two days later Blackie came alone. He spoke in a querulous voice I had never before heard from a blackbird and then he, too, was gone. In the span of several days the raucous singing of the flocks was stilled, as thousands of blackbirds darkened the sky, and were seen no more. I finished the novel later that week. And so it was with an eye to the sky that I worked last summer, hoping for their return. Blackbirds are colony nesters and do not invade town to forage until they have raised their broods, but as the fireworks of the Fourth burst forth and died my hopes began to fade, and when I sat down to breakfast on July 7th I was resigned to the likelihood of never seeing them again. Compared to most songbirds a blackbird’s voice is unmusical, but to me it is as lovely as the whistling of a thrush, and with the first grating “aawk” I was running to the door. Blackie was perched on top of the cage, showing me his bold white eye. I wanted to tell him that the book was finished and he and his brothers and sisters deserved credit, but he no longer had much use for a blackbird who couldn’t fly, and after letting me admire his iridescent plumage, he flew to the top of the spruce where I had so often seen him herald the dawn. I had but a fleeting glimpse, his fearsome countenance silhouetted against the sky, and then he was gone, this time, perhaps, forever.